A few months ago I ordered and got a set of these planters and me and my plants just love them. So I ordered another set. And now I have twice as many happy plants occupying them. If I ever (smile) get more plants I'll order another set. I love the nice variety Miles Kimble has. ?? I have a greenhouse we have built this winter. I have plants already started in these hanging baskets. I think they will be great! As someone else mentioned, I drilled holes in the bottom for drainage! I'm excited to grow the flower called 'hens & chicks' in this next Spring! 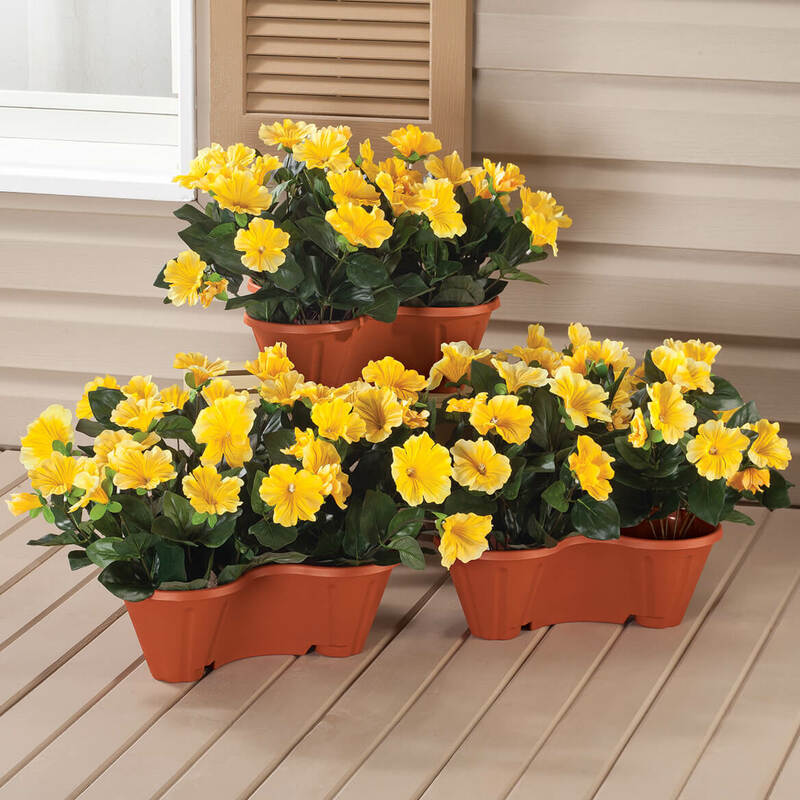 Waiting for spring to actually use them with the pansies sold on this website. From the looks and feel of the product it seems like an excellent buy. I bought 2 sets of 3 and stacked them in sets of 2. 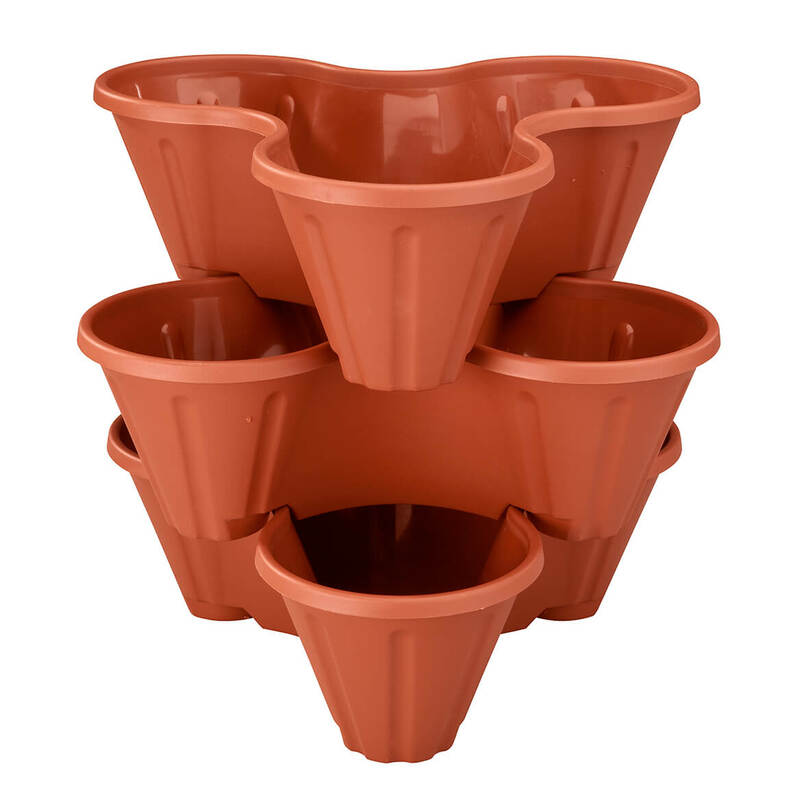 By only drilling out the holes in the top one and not the bottom one of each set, the water could drain from the upper plant pots and be easily emptied without making a mess on the shelf. I am able to have more plants in less space--always a plus. These planter look terrific especially after getting the plants started. They add a lot of color and variety of plants to any patio/deck without taking up a lot of room. This is a very cute planter. However the drainage holes are hard to poke through so water collected making the plants soggy. I am using them for strawberries, hopefully they will do good, I did add some holes for drainage but that was easy just had the husband drill some holes in them! They are lightweight but seem sturdy enough for my use. I bought it in the past to hold a number of plants. I have not utilized it well. I tried these for strawberries - they grew but no luck with the berries!! Looks intriguing. Excellent price for amount of plants to use. My friend has one and it is gorgeous as an herb garden. I never received this item, why!! I even bought flowers for this planter, At first thought U were out of stock, then forgot about it. The planter would have looked great in front of my house. Oh well, it's a mystery, now it's your turn to find out what happened and why I did not receive the planter!!! I needed planters to put on a tree trunk to form a half circle. Had been looking at this product for a while at a much higher price. So I decided to purchase 2, one for mom. i picked these because I saw a video of strawberries planted in them and thought for the money they would work well for me to put strawberries in . so once i get them we will see how it works hoping for the best!!! To put flowers on my deck. I want to plant strawberries in it! I needed multiple planters with a small footprint. Already have this planter works great for herbs! Purchasing today for Christmas gifts! Loved the price and the flexibility! I bought one just like this for my MOM and she loved it. My sisters are trying to take it away from her cause they loved it too. That is why that I am buying two to give as gifts for my sisters. Love it. This is my second one. The price is very good in comparison and with the free shipping it is a significant bargain. 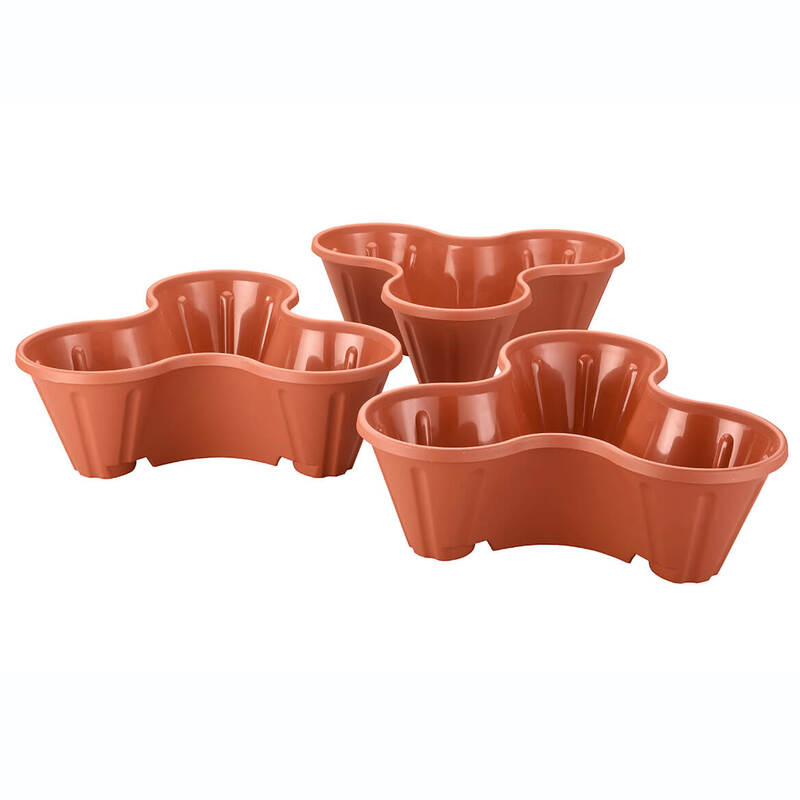 These stacking planters look like an attractive way to plant herbs for the summer and strawberries for the spring. It seems practical for my apartment. I need to dress up a bare area and thought these would look nice on either side of a bench. 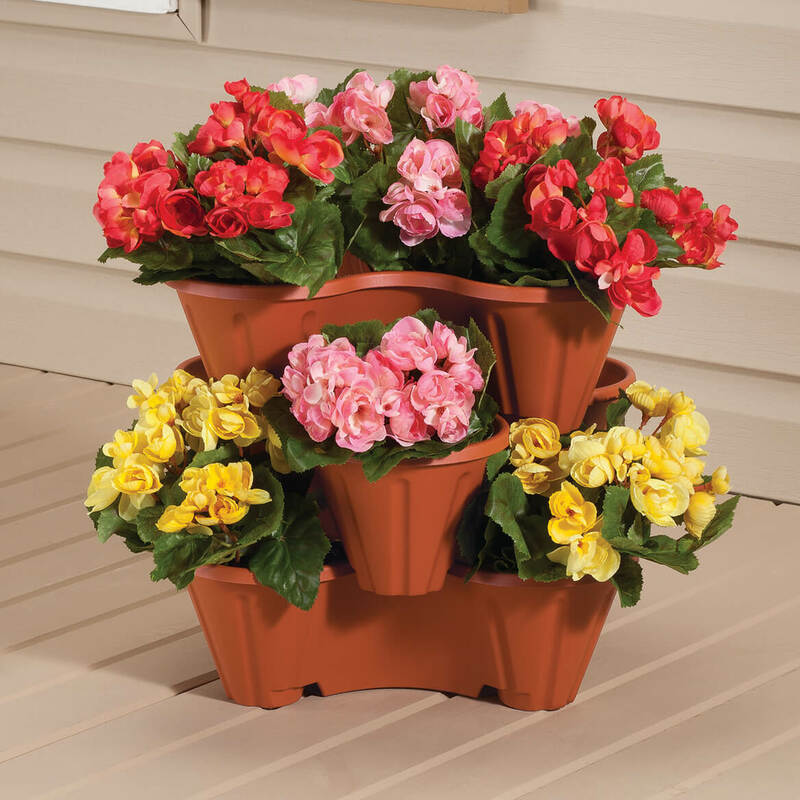 I chose this stackable planter because it's very unusual and holds many plants with limited spacing. I owned a set of these in Florida and absolutely loved them. They are sturdy yet flexible enough to use year round. Planting in them is so easy -- 10 plants in all!